LİSTAG, founded in 2008, is a solidarity and support group for friends, families, and especially parents of LGBT (Lesbian, Gay, Bisexual, Trans) individuals, actively working against homophobia, transphobia, discrimination, and hate crimes. LİSTAG organizes weekly meetings where newcomers are introduced to the group and forthcoming activities are planned, as well as monthly dinner parties where they get together with families of LGBT individuals. LİSTAG also meets every first Thursday of each month with volunteer psychiatrists and psychologists from the Society for Sexual Education Treatment and Research (CETAD) to discuss subjects like sexual identity, sexual orientation, sexual roles and behavior, and gender. LİSTAG parents joins also “coming out” meetings at Lambda Cultural Center every third Saturday of each month. To gain visibility in Turkey, they participate in discussions, panels and meetings in cooperation with NGOs and universities, giving interviews to the media. 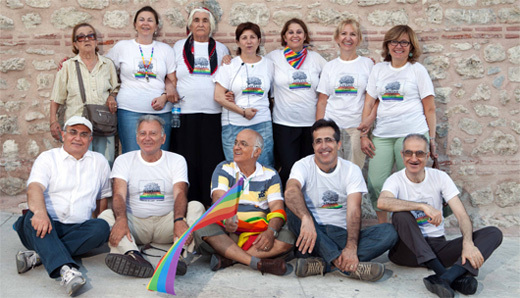 In addition, LİSTAG has been participating in the annual Istanbul Pride March since 2008, and has become one of the most striking groups in these marches. LİSTAG also cooperates with other parent and family organizations in the world, organizing joint meetings with AGEDO (Italy), BEFAH (Germany), FFLAG (England), and AMGYL (Spain). Since 2008, LİSTAG has opened up an important political space within Turkish society. Acting in solidarity with LGBT individuals and their organizations, LİSTAG has intervened in the current political sphere, by releasing public statements and engaging with politicians, thus becoming a crucial component of the movement. It has also encouraged LGBT individuals, by reminding them that it is not impossible to come out to their families. The most important contribution of LİSTAG to our society, has been in offering an alternative to the notion of a traditional family. LİSTAG parents, sometimes faltering, other times accepting, always making an effort, and never losing the capacity to re-discover, but most importantly always with ‘unconditional love’, have been able to question and challenge the culturally inherited traditional family codes based on kinship and territory. With reference to Judith Butler’s concept of ‘performativity’, we can define this new ‘family’ as “an intentional family, which comes to being through conscious effort.” In every meeting and demonstration they participate in, LİSTAG parents stand by their LGBT children with the message ‘I’m on my child’s side!’ and remind us that another type of family is possible and despite the prevailing assumptions, anybody’s child or relative can be an LGBT individual. These parents, through their children’s sexuality, have managed to openly discuss their own sexuality, as well as issues around sexuality in Turkey. They have also made great efforts to help other families whose children have recently come out, by teaching them that homosexuality, bisexuality, or transsexuality is not a physical abnormality or perversion. In this way, they have been lifesavers to countless families by reminding them that they are not alone in this world.